The big show on at the moment in the Victoria and Albert Museum, London, is Pink Floyd. There were long queues on Saturday when I went there and tickets were sold out by two in the afternoon. But a museum like the V&A – well, there is no museum quite like the V&A – is an exhibit in itself, and there’s a lot to see in the structure and decoration of the building. I usually look in at the Poynter Room, one of the three restaurant spaces on the north side of the building – the others are the Morris Room and the Gamble Room. They’re all interesting, but I particularly like the Poynter Room because of its tin-glazed tiles that tell you something of the early history of pottery teaching. 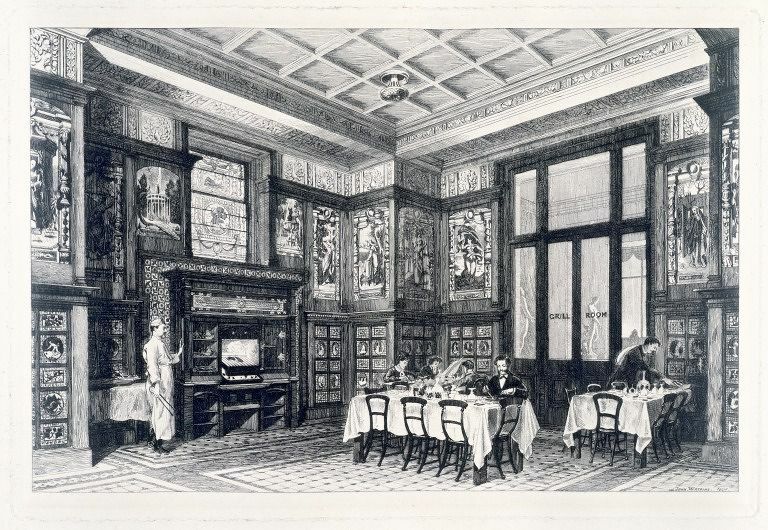 The Grill Room, an early engraving. The tiled decoration, which goes round the room from floor to ceiling, depicts the months and the seasons, painted mainly in blue and white in Delft style. 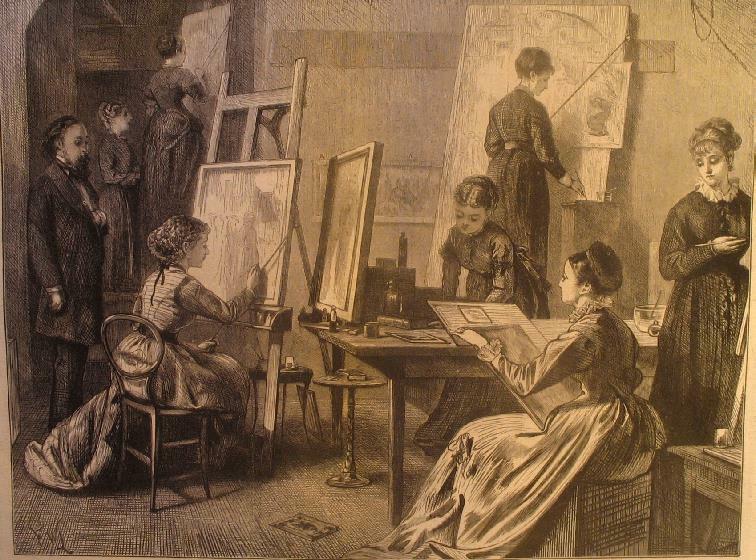 Poynter made detailed scaled drawings of the scheme (one of which was on show in Room 125 the other day) but the execution was by women students of the NAT. The training they received was a rare departure from the rigid academic syllabus dominated by drawing and copying which was intended to instil knowledge of good precedents and an understanding of the principles of design. Practical work was almost unknown and was only introduced at the end of the century when Arts and Crafts practitioners began to take over art school teaching. The decoration of these tile was virtually the first pottery teaching in a British art school. The fact that the Poynter room is unchanged from 1870 enables us to see the results of this experiment in detail and honours the women students. 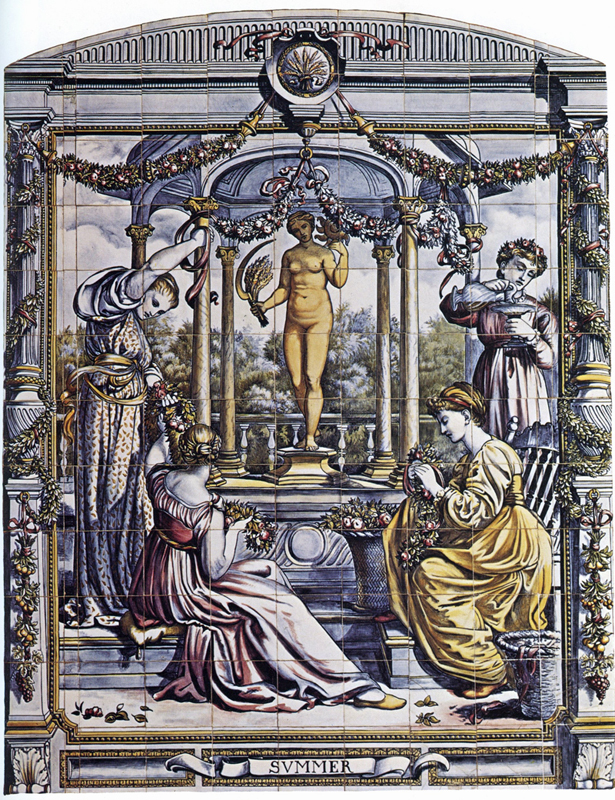 The tiles were made by Mintons and decorated in South Kensington. The Graphic Magazine wrote up the class and included a picture of it (below). We know the names of these women: they were Amy E. Black, Miss Walker, Miss Judd, Miss Earle, Miss Hall and Miss Cambridge, who were all paid at the rate of 6d an hour, except Amy Black who received 9d. The intention of this programme was to qualify ladies for respectable employment. The relationship between the NAT and Mintons continued after the work on the restaurant was completed, and Mintons opened an Art Pottery Studio in Kensington to provide jobs for the graduates. (I’ve written about it here.) The studio was not only a huge success, it encouraged a craze for amateur pottery-painting that lasted until the end of the century. 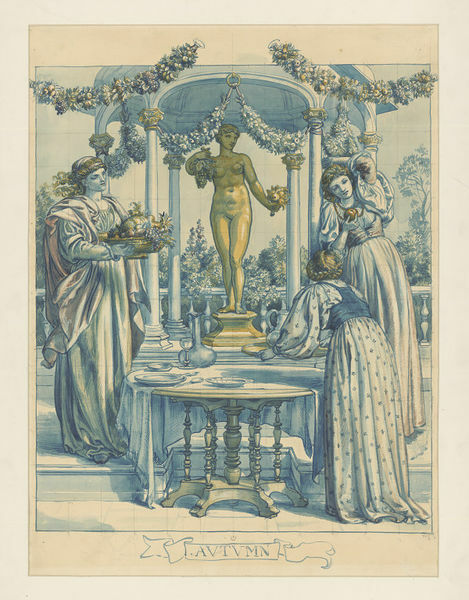 So next time you’re in the V&A, take your meal in the Poynter Room, admire the tiles and raise a a cup of tea to Poynter, to Mintons and to Misses Black, Walker, Judd, Earle, Hall and Cambridge.